Op-For has a post up linking to a post at a blog called John Q. Public. The JQP post regurgitates elements of the POGO-annual-diatribe-against-something (won't link to POGO here--maybe later if I deconstruct Mandy's rather wan opening act in POGO's center ring (replacing now retired Winslow Wheeeler). Note the usual suspects that have been against just about every weapon system since about 1970 listed in JQP's blogroll, What this particular post does is echo the annual (March) CDI/POGO diatribe against whatever weapon system they are most against this year. Now, I normally advocate arguing the data and not the source, except POGO has never (to the best of my knowledge) ever argued facts without prevarication, or presented a 'fact' that was ever without a perversion of truth applied. This time is no different. But in this case however, the most irksome part of the JQP post is the anonymous author's references to an anonymous F-35 'pilot', whose ALLEGED comments reek of somebody lying someplace. Since it is anonymity upon anonymity, it could be the pilot in question is lying and/or a weak sister. It could be the author is making up pilot quotes out of whole cloth, or adapting past JSF 'news' and 'rants' to fit what the author believes or wants the readers to believe, or it could be any combination of all the above. I have a good friend whose Sister is now retired from Journalism and who has related that in her experience most of the time 'unnamed sources' are journalists making sh*t up. I could pick apart every one of the alleged quotes and posit likely true origins for most of them before their perversion, but that could put us into a gray area where I don't care to go . So lets make a wager on something the so-called pilot claimed knowledge about: The F-35 doing poorly in 'recent' High AOA/BFM "tests". I will bet dollars to donuts that IF the program chooses to respond to such hooey, that we will discover the first two BFM "tests" were in the middle of January, the first two flights were on two consecutive days, the missions were flown by two different pilots, and both of them had nothing but glowing reviews about the jet's performance. If I find eventually a public source to validate this 'guess' I will be happy to also share who I 'guessed' were the pilots, which flight they flew, and which plane(s?) was/were flown.And perhaps even quote the pilots. Update: JQP is a blog published by a Mr. Tony Carr. I thought it was a group blog with an unsigned author. Naw. I looked him up at lunch today. He's attending law school now. Ret. (early?) LtCol C-17 driver. Commissioned after I retired, and retired after less than 20 unless he had prior enlisted time. I would probably be most interested in almost anything he had to say on Air Mobility/Air transport topics, but on Acquisition? Fighter tech? Rank amateur. Trust me, he has to have had something on the ball at least at once upon a time to have made it through his Freshman year at ERAU: the distractions in Daytona Beach tend to weed out the less disciplined students pretty quick. So I've filed him under "intellect held captive by ideology and inexperience". ...Surprised he wasn't b*tchin about the number of controls on the HOTAS. In any case, the claim about BFM maneuvering was total BS and I'm willing to wait until the program talks about it. I would find reliance on any one operator's opinion on PVI laughable either way-- given the number of pilots that were involved in the design, development and maturation of the 'office'. There was extensive testing of the Pilot Vehicle Interfaces (perhaps hundreds of pilots' inputs; from 'mock up' to labs to simulators to flight test) and the overwhelming positive public attributable statements from the drivers taken as a whole. Of course, for some people it is simply much easier to apply the standard Fallacious Circumstantial Ad Hominem and cry 'disaster!' and 'cover up!' to suit their predisposed views or mood. But you'll never get to the root of their 'argument' you'll never find one that isn't just a tarted-up opinion built upon some distortion of reality. Hey! I'm now mildly curious if his 'pilot friend' was one of those "get gunned every time" guys from a couple of years ago. It would explain much. To save time and avoid useless back and forths with the "foot-soldiers" and "loyal babblers" through the rest of the Congressional silly season, it looks like I'm just going to have to do a Know Your Reformer update on this 'Mandy Smithberger' person AND 'Fisk' her little rant that is now echoing (as designed) and kicking up this crap all over the usual corners of the web. Heck, I may do so if only to emphasize how the Faux Reform Meme Machine will attempt to keep marching on, now that the "Old Guard" are falling away and the 'echo-reformers' are taking over. Teaser: If I do it, the post will have the best pic of Winslow Wheeler in his most natural (transactional analysis sense) state EVER captured. RE: Q: How does an aircraft that takes over 60 seconds to accelerate from 0.8M to 1.2M at 30k ft ISA have "at least" the maneouvrability of a Block 50 F-16C which does this in less than 30 seconds, with 4 missiles on board? Well Skippy, your first big problem is that the only F-16C Block 50 that can go from M.8 to M1.2 in "30 seconds" can only carry two missiles and....its about out of fuel. Your second big problem is that you are comparing your infeasible F-16 loadout with an F-35 KPP configuration that is carrying 60% (of a much larger capacity than the F-16) fuel load AND 2 tons of bombs. To answer your question more fully, and as a object lesson to others that it is YOU who are really pedaling the "indifference to reality" with hyperbolic nonsense, the F-35A at KPP weights and loadouts SPANKS the Block 50 F-16 in transonic acceleration for all but at the very lightest weight/drag combinations identified in the F-16's operating manual. Only at the lowest weight/drag combinations can a Block 50 transonic performance best the F-35A KPP configuration. Remember the F-35A is carrying 60% internal fuel AND two 2K Lb JDAMs. "at least" the maneouvrability of a Block 50 F-16C. KPP Requirement or no, ‘What If’ the F-35 will someday really need to get rid of all or part of extra seconds in the new KPP enroute to Mach 1.2? The F-35 Transonic Acceleration KPPs were ‘changed’. This change was almost immediately decried far and wide as a failure by the ill-informed and self-serving critics. I’m certain some have forgotten or missed the discussion in Part 1 where I referenced the DoD documentation describing the process by which KPPs are established, and changes are made, and that they are only changed if the changes are validated as being operationally acceptable. I’m certain others will miss the references in Part 2 where it was highlighted that they changes were always going to happen, if only because you cannot violate the laws of physics. (Those people may be sputtering at their computer screen soon if they aren't already). That the F-35 KPP changes were implemented at all proves the changes were acceptable by those responsible for the integrity of the requirements and supporting system engineering process. This post and series is not for those people. BUT!... probably, someday, someone flying one of the F-35 variants is going to REALLY need to accelerate M.8 to M1.2 as quick as the original KPP specified or even more quickly (just not often enough to pursue it as a KPP). Truth be told, there’s probably going to be a time or twelve where somebody is going to wish ‘instantaneous’ translation to Mach 10, but you have to draw the line someplace within the laws of physics. IF there is some operational need to shave all or part of 8 seconds (or the longer times for the other variants) going from .8M to 1.2M, can it be accomplished? If so, HOW would it be done, and is the remedy needed so onerous that it will adversely impact the F-35’s viability or operational utility? With the F-35A needing only to overcome 8 seconds, the program office could have easily just specified a lower weight to accomplish the feat, and a checklist item added to the effect of “if you want to do ‘this’, then ensure fuel and weapons on board do not exceed X lbs”. But as fuel on board at a mid-mission point tends to be a valuable commodity, and weapons carriage is a fighter aircraft’s reason for being, I presume everyone can see why the users, JROC and program office didn’t take that route. 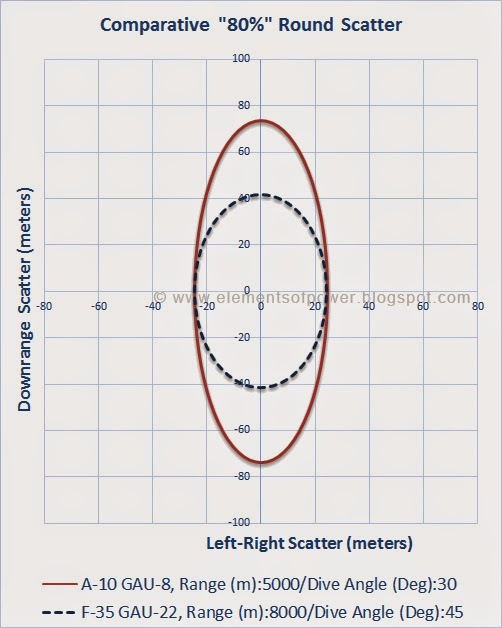 If, by chance, “8 seconds” is a big deal, even for an aircraft with a ‘greater initial acceleration than an F-16’ and it still means those 8 seconds crossed some breakpoint minimum needed operationally, then the good news is it is rather easy to accommodate. In fact, fighter pilots have been using ‘this one weird trick’ (Man, I hate those ads) for decades to squeeze extra acceleration out of the transonic region. You can also bet any future opponent that the F-35 runs into WILL also be doing the same thing. Sometimes ‘unloading’ will be the best thing for a pilot to employ, sometimes something else will be the best thing to do. Aeronautics has advanced to exploit the medium to its maximum. There is no magic airplane that does everything better than any other airplane within each generation or two: there's always a 'catch'. An eight second difference for the F-35A in all probability translated into achieving something like Mach 1,1-Mach 1.18 in the original 55 seconds. That's small potatoes as far as overall speed goes. The total peak drag coefficient in this instance is reduced by 25%. 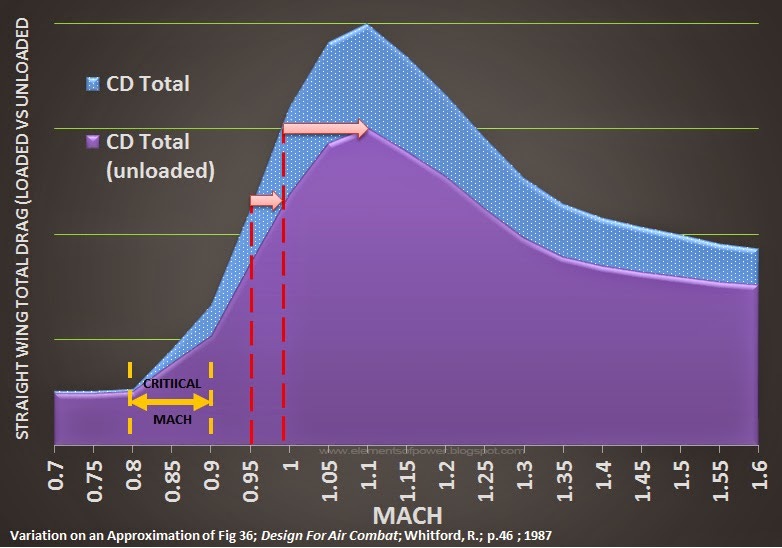 Observe in the next figure that the peak drag coefficient ‘unloaded’ at around M1.1 is about the same as just before Mach 1 ‘loaded’, and that even in the typical Critical Mach range for fighter aircraft between M.8 to M.9 (Shaw, “Fighter Combat”, Pg. 399) the drag coefficient is reduced. IMHO, the F-35 Critical Mach Speed, like most advanced fighters, should be well into the upper half of that range IF the performance measures in the Bowman paper are to be believed (We’ll get to that in a moment). 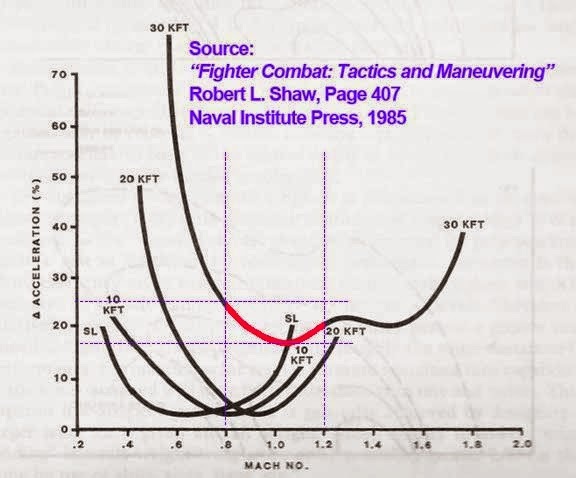 We see in Shaw’s chart that for legacy fighter designs flying from .8 Mach to Mach 1.2, unloading increases the acceleration rates between ~17% at M1.0 to as much as ~20% at Mach 1.2 and ~25% at .8 Mach at the 30K ft KPP altitude (Ref #9). This appears consistent with what we would expect from the differences in the drag curves shown in our examples. It should also be readily apparent that both the F-35B and F-35C could employ the ‘unload’ technique in the same manner as the F-35A. Obviously, the F-35B would only need a small ‘bump’ compared to the F-35C. The smaller the time/speed difference needing to be closed, the more flexibility on timing and duration is available for the pilot to choose when and how long to ‘unload’. Figure 25: Unloading and/or Diving to Achieve Original KPP times. The F-35C’s obviously much greater wave drag due to lift than the other two variants (expanded upon in Part 2) also means it would just as obviously benefit MOST OF ALL from the unloading technique. If a dive would be necessary for the F-35C (as the ‘worst case’) to meet the old transonic acceleration standard, it could be able to carry that acceleration beyond 1.2 to perhaps even M1.6 (F-35 Max Speed in level flight. We do not know what the 'never exceed' speed is, so we’ll stick with what we know the F-35C can do. 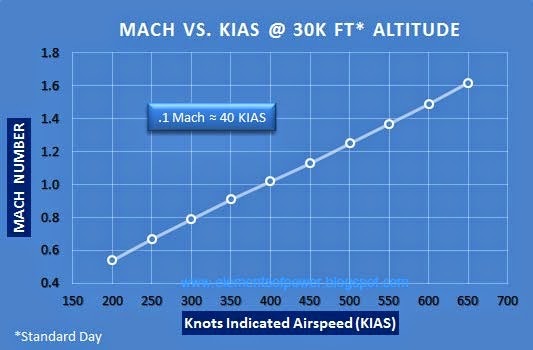 If ending the acceleration run at the same altitude (30K feet in the KPP) is important, the F-35 pilot can accelerate beyond M1.2 and so after climbing at the end of the run, trading smash for altitude, the plane is still flying M1.2 or better. This might be a good time to interject the observation that if there was ever evidence the original KPPs were established before the aircraft design was even undertaken, it is the original common KPP of 65 seconds for the F-35B and F-35C: two airplanes with vastly different weights and wing areas. This tells me the trade space for the F-35C design might not have been fully understood when the Navy laid down the requirements or the KPP really was a 'let's see what we can get' figure. We should also note here that the KPPs were/are against a predicted weight standard and that all indicators are that the predicted weights are being beaten, with all variants coming in (for now) below the modeled weights used for the KPPs. Those lower weights mean lower wave drag to begin with, and in turn better transonic acceleration. Shaw asserts that unloading for best transonic acceleration is done close to ‘Critical Mach’. Bowman (Part 2 Ref #9) identifies the F-35A KPP threshold for max speed at 30K ft altitude without afterburner at >.96 Mach. This speed cannot be too far above or below F-35A Critical Mach because “at speeds faster than the Critical Mach number the drag coefficient increases suddenly, causing dramatically increased drag”. Afterburners (and/or unloading) would soon be required to go any faster once Critical Mach is reached. Bowman BTW, is now a Navy Captain, and as far as I know continues to NOT be an F-35 'fan'. I'm still hoping for some karma backlash that will tie him to the F-35 program as a developer or operator, just for the entertainment value alone. Other than changing the KPPS evidently was not a 'big deal', there's not much to conclude: just a lot of open questions remain. That the program was warning far ahead of the KPP change that the spec was unrealistic (Ref #3 and #4 in Part 2), makes the initial acceleration KPP looks more like it was a ‘show us what you can do and we’ll revisit the issue later’ placeholder. An entirely likely possibility is that as the program matured, different advantages were seen in areas of aircraft capabilities that shifted design emphasis to 'someplace else'. A KPP may be set based upon an assumption of X capability would require KPP X to be one thing, and then as the design matures, and operational concepts evolve or even threat perceptions shift, it becomes apparent that X capability isn't as important as Y capability, which if is addressed would require more or less out of the KPP X. Examples? Program news over the years seemed to talk a lot about range and carrier approach handling as being 'big deals'. Did range become more important than acceleration? If so, fuel could have been added which increased weight and that reduced acceleration. For the C model, did the Navy decide a bigger, higher drag wing meant fewer carrier landing mishaps? It is also entirely possible one or more of the variant KPPs started simply as a wish-list item. We've heard before about he F-35 KPPs being based upon aerodynamically 'clean' legacy aircraft specs. Was that a 'miss' where the initial KPP-setters failed to recognize the physics involved, or they did recognize it but since there was no design to evaluate at the time, they let it go: leaving it as an admirable goal but also knowing the KPP could always be changed later? That last explanation makes most sense to me. I've dealt with the acquisition system bureaucracies for decades, and that kind of development seems totally in character for how the system works. But whatever the reason, we can only 'guess'. We don’t really know 'why', and I wouldn't be surprised if no one is still around within the program who remembers the 'why'. It would make a terrific question for some politico to enquire about, especially if there was some dark secret behind the change as F-35 detractors seem to often insinuate. For the F-35A model, the 8 second difference between new and old KPP appears to be trivial. The F-35B would probably have to unload a few seconds earlier or for a few seconds longer to meet the old KPP and the F-35C may have to unload a lot earlier and for a few more seconds to do the same. But it is hard to say for certain, because the B and C early acceleration profiles may be just as good as pilots flying the F-35A assert about the CTOL version. The F-35C might have the toughest time making up the acceleration difference because it has a much larger non-lift contributor to wing wave drag to go with the larger lift contribution. But as it is also slightly longer overall and especially longer in the wing and tail surface areas, the F-35C shape in its entirety may (I don't think so but I can't rule it out) be lower drag than the others above Mach 1.1+. Or the F-35C may have other lower drag advantages due to something like its ‘cleaner’ wing attachment transition on the bottom surface. Who knows? The newer 'changed' KPPs are as far as we know, still based upon modeled F-35 performance using “end-of-life, worst-case” scenario relative to the F135 engine’s power capacity” (Ref #7 Part 2) and “two per cent thrust” penalty (Ref #8 in Part 2). These ‘wedges’ against the F-35's performance could also be the difference between meeting the old KPP and needing the new KPP in the case of the F-35A, and part of the difference for the F-35B and C.
The changes might also (almost certainly for the F-35C) have been due to encountering an ever-so-slightly higher than planned/predicted peak transonic drag coefficient, or some combination of the above. Contrary to what some might think, computational fluid dynamics and wind-tunnel testing do not prevent small surprises when the aircraft finally flies, they just lower the chances and severity. Sometimes those surprises go undiscovered for years (Bitburg Roll anyone? ), and frankly I'm STILL surprised at how little difficulty the F-35 has had in some performance areas compared to legacy aircraft. 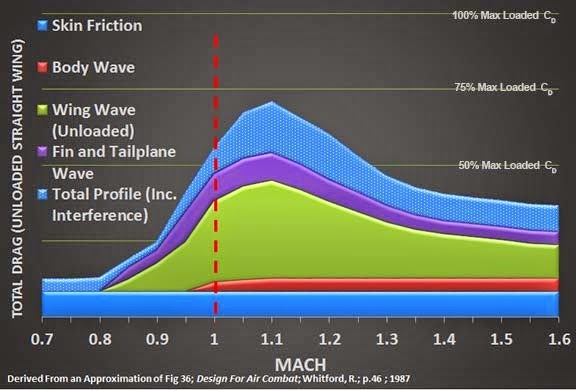 Beginning at about .8 Mach, even the tiniest drag [design] differences affect an aircraft’s [drag] performance out of proportion to the differences. 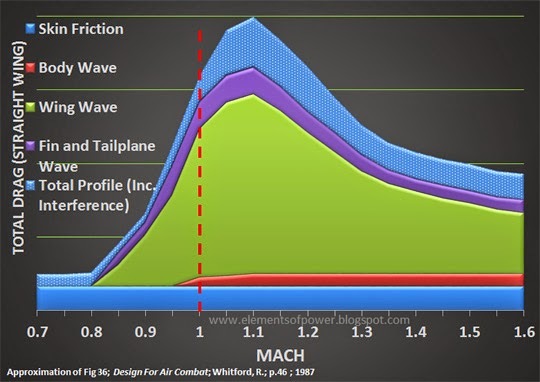 The ability to cruise in military power at Mach 1.2 for some distance (Part 2, Ref#2) indicates that for the A and the B model at least, that ‘peak’ in the Drag Coefficient around Mach 1.1 is a fairly narrow one. The people buying and flying the airplane apparently say ‘yes’. And they've got the data and required knowledge and judgement to make the call. The voices outside the program do not. Acceleration Sidebar: Is Acceleration More Important to Offensive or Defensive capabilities? If I had to make a guess as to whether or not F-35 transonic acceleration was more critical in the A2A arena for closing on an enemy or escaping an enemy, I would say it is more important as an offensive attribute for closing on an enemy. Why? For two main reasons. First, I seriously doubt there is a fighter in existence or on the drawing board that can be expected to consistently attempt to overtake an F-35 without hesitation: or any aircraft that will competently shoot missiles over the shoulder at their pursuers. Second. The F-35 is being fielded as an optimal pack hunter: any aircraft pursuing one F-35 will always be a little more cautious if the pilot has reason to expect there to be another F-35 or two that he has no clue as to where it or they are. Stimulated by Commenter 'Tim A.' in Part 2, I'm going to do a quick parametric examination of transonic acceleration differences between the 'ultimate' F-16 (Block 60) and the F-35A at A2G and A2A weights and loadouts. Nothing too extensive-- just something to ponder. The Air Force Reaffirmed "A-10 retirement decision" in a "Week"
Anyone with reasonable exposure to the 'issue' could have done the same thing. If I thought anyone was interested, I could lead a little online systems engineering exercise. Except we'd have to endure the "Because Big Gun!" argumentation. You already know where I stand on that 'point'. And Ohohohohohohoho the A-10 fanboys of the U.S. Nostalgia Force are going to go ape-you-know-what over this one. After a week of concentrated study of its close air support (CAS) role, the US Air Force essentially has decided to stick with plans to gradually retire the Fairchild Republic A-10 Thunderbolt II and hand the CAS mission to the Lockheed Martin F-35. It really just took a week to run everyone involved at the top through the relevant information already in hand. The CAS "controversy" has been studied to freakin' death leading up to this moment, and it's not exactly like ANYONE who has paid attention doesn't already know the USAF has been looking at A-10 obsolescence growing......... like, forever. The article at FlightGlobal lays out pretty much what one would expect. 2. Look at alternatives to fill any gaps during the transition (as F-35 capabilities mature). That's not 'too complicated' is it? Some good details at the link, such as still having dedicated CAS units (Which I note did no good to appease the 'A-10 forever!' crowd the first, last, any time. If I were to open a group SE exercise to derive requirements for a CAS aircraft, I would start by asking "What capabilities are necessary in a CAS plane? After the dumb*sses with the 'big gun!' ,'fly slow! ', derived qualities spouted off, and if we even cared, we would probably employ the 'Five Whys' approach to backing out the top-level requirements. Example: Why do we need a big gun?, and then based upon the answer, ask why that answer was valid, and etc back to the truly top-level requirements. In doing so, we would arrive at a list of characteristics: effective targeting, responsiveness, lethality, survivability, persistence, etc. F-35 optimal attack profile with GAU-22 vs.
A-10's even at a much longer, safer range. There would be multiple paths that could be followed to meet a desired top-level requirement: a 'Big Gun with lots of ammo' is but one technical solution to 'lethality'. But we also have 'effective targeting' which does not just support overall lethality objectives -- it also includes "safe to employ" as one of many sub-elements of "effectiveness". So once we got into looking at the optional material solutions we could select for 'lethality' we would then perform tradeoffs among the many desired attributes, and many of them will be contrary to each other. A balance among all of the attributes would have to be achieved. But we don't have to do this study. It's been done to death. And it wouldn't have to have been done very well at all to produce an argument that beats PFC Short Stroke's anecdotal recollections of 'that day in the 'Stan', UNLESS we can count on CAS not ever/likely needing a 'better' (as in 'survivable in a medium-high threat arena') weapon system than the A-10. If you can't guarantee a low-threat battlefield future, you have NO basis for preserving an asset that is only survivable in a low-threat environment. That's not the only reason the A-10 needs replacing, but it ought to be the easiest one to grasp. I usually enjoy Eugene Volokh's stuff. Though his move to the WP was disconcerting, I got over it. But Volokh has a BIG swing and a miss in describing a 'growing' rationale for an argument that the Supreme Court should revist/reverse previous court opinions and enforce Interstate Sales Tax collection the way the greedy little state and local politicos/taxmen WANT it enforced. This argument has grown stronger, and the cause more urgent, with time. When the Court decided Quill, mail-order sales in the United States totaled $180 billion. 504 U.S., at 329 (White, J., concurring in part and dissenting in part). But in 1992, the Internet was in its infancy. By 2008, e-commerce sales alone totaled $3.16 trillion per year in the United States. Sorry, those are RAW numbers. 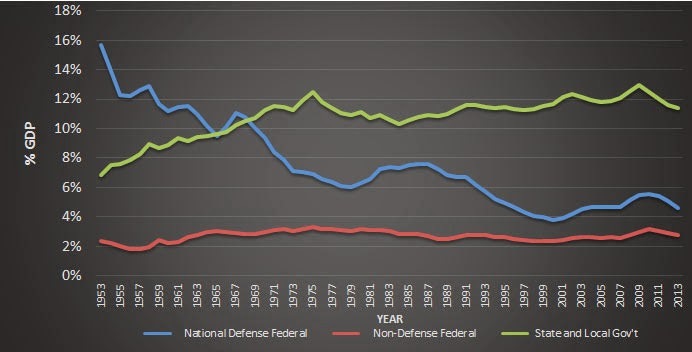 What does the trend look like factoring the overall economic environment. I'm assuming internet sales have supplanted most catalog sales: a pretty safe assumption I believe. And even if it's not, if someone can compare them directly across the timeline--well then! So can I. 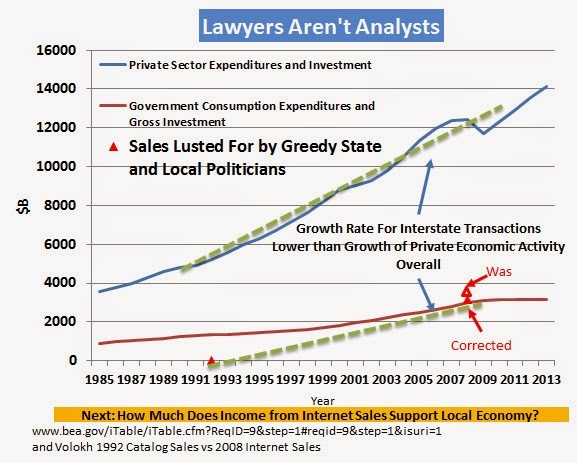 The big number for 2008 compared to the little number in 1992 overstates the growth in interstate sales. Complaints about 'missing revenues' from politicians reeks of unwillingness to compete, and worse a certain sense of entitlement to other people's dollars--no matter what the source--to feed the allmighty 'state'. As the 'Barf Box' at the bottom of the chart indicates, NO ONE ever seems to ever ask the question as to what entities receiving all that internet revenue spend it on -and where? I would normally presume states with the better internet-friendly tax laws would benefit most and the local governments would be happy about it. But I realize we're dealing with people whose lives are often immune to the direct effects of the real economy, and I think more than a few resent the denial of an "opportunity for graft". State and local government is THE 'Growth Sector' of government. Rogoway opens with the little Punk Journalistic lie in the title: F-35 Can't Carry Its Most Versatile Weapon Until At Least 2022. Rogoway’s ‘article’ is about the F-35 and the Small Diameter Bomb Increment II (SDBII) , or GBU-53/B. When it comes to the F-35B and this game-changing weapon, the problem is fairly simple. The F-35B, even with its truncated weapons bay compared to its A and C model cousins, was supposed to be able to carry eight SDB IIs internally. The SECOND biggest problem with Rogoway’s hit-piece, is that it is written up as if it is the F-35 program’s and in particular the F-35B’s ‘fault’, when anyone who’s been following both programs for any length of time knows that the SDBII development contract was awarded to RTN in 2010, quite a few years after the ‘size’ of the F-35B’s weapon bays were set, but not before development was completed. The SDB II program went into that situation with eyes wide open. Further, Rogoway's article (through his ignorance?) was/is written up without recognizing certain protocols of aircraft weapons design and integration. ESPECIALLY the one that requires new planes to be compatible with selected existing weapons for integration, AND that new weapons are required to be compatible with existing planes on which they are designated to be used. Normally, any conflict between the F-35B and the SDB II would be a ‘hit’ against Raytheon, but since Raytheon wasn’t being beat up for busting some Outer Mold Line envelope, it took me all of a few minutes to locate information WHY no one was pointing fingers (other than Punk Journalists that is). The SDB II program office has made considerable progress on the F-35 risk reduction effort to address the ongoing F-35 System Development and Demonstration program delays. The SDB II team successfully conducted F-35B and F-35C weapon’s bay fit checks utilizing production jets. The data collected during these fit checks will be used to finalize the modification of the F-35B weapon's bay. These efforts are on track and serve as a critical risk reduction event for both the SDB II and F-35 programs. Talk about ‘concurrency’! This is multi-program concurrency! I'm surprised someone's not b*tchin' about that angle in this....yet. By 2012 both programs had experienced delays. More were to come. Those fit-checks referenced in the SAR 'happened' by the way. So,,. is Rogoway spotlighting some F-35B issue not known before, not in work, or likely to ? Rogoway doesn’t like how the SDBII deployment is ‘happening’. Is that the F-35B’s “fault”? According to program officials, the biggest risk facing the program is integration with JSF. If JSF cannot meet its design specifications, then SDB II may not meet its requirements for weapon effectiveness or availability on that aircraft and may need design changes. The JSF is now integrating other weapons which will allow the program to determine the accuracy of its design documents. Many of these weapons have more stringent thermal and vibration requirements than SDB II. Additionally, SDB I will begin integration with JSF about 2 years prior to SDB II. By integrating with JSF after these weapons SDB II will be able to leverage data from these efforts. Did Rogoway expect the entire F-35 program to re-jigger it’s schedule (no chance of delaying anything else is there?) JUST to put the FULL INTERNAL SDB II load on the F-35B earlier? I note here that if the program so desired, they could load 4 SDB II’s internally early and 8 later, and all the while put the full external pylon SDB II loadout on as well. And it’s not as if the SDB II is any different than any other program. To hear Ol’ Ty tell it, the SDB is 'ready to go' and ONLY the F-35B weapons bay tweak is holding it up. Sorry, the SDBII story was still being written as of last year’s GAO rundown on selected systems (pg 119-120). I expect this year’s report will give the ‘all clear’, but it can cloud up again as well. Writers don't always write the headlines to their stories. But I didn't hear anything about Rogoway being arrested for beating up his editor over it. Therefore either through commission or omission, Rogoway's culpable for this trash. As an aside and IMHO, what this 'issue' looks like is a minor tweak of F-35B weapon bay content arrangements, including all the little ticky-tack pieces of suspension equipment, weapon interface busses, and stuff that is just passing through the weapons bay. I make this observation based upon the acute lack of hand-wringing in the responsible corners, the 2013 'fit check' that cleared the weapon-weapon and weapon-door clearance....and program spokesperson statements at Rogoway's source... that Rogoway didn't bother mention. Doesn't require much insight, just a lot less bias. Now, we’ll ignore all of Rogoway’s usual and lesser affronts. such as alternating between effusive awe and hellfire damnation over things that must seem to be like magic to him, use of ridiculous hyperbole (SDB II ‘A.I.’ -- ROFLMAO on that one), and all the self-referential linking to past articles where he didn’t do his research then either. Never mind, that the Brits aren’t planning on even buying the SDB II yet (even says so in the UK Mail piece), the title 'says it all'. Really? REALLY. 90% of readers won't read the article, 90% of those who bother won't recognze the cognitive dissonance between the title and content. Joe DellaVedova, a spokesman for the F-35 program, said in an Inside Defense interview last week that changes are being made to the jet so it can be released on schedule. DellaVedova also said that Lockheed Martin will likely get the alterations contract down the line in 2015. 'This is not a new issue to us,' DellaVedova told Inside Defense. 'We've been working with the SDB II program office and their contractors since 2007. 'The fit issues have been known and documented and there were larger and more substantial modifications needed to support SDB II that have already been incorporated into production F-35 aircraft. Inside Defense reported that the Joint Strike Fighter (JSF) program office so far has not publicly recognized problems - and that eight internal and 16 external SDB IIs are in fact meant to go on the F-35B. Note the part above about the last "alterations" not yet being on contract? Is that important? I'm pretty sure it is. Inside Defense had this out last week, and the DellaVedova quote above was in Rogoway’s source. But Rogoway made nary a mention of it. What’s the matter Ty, it didn’t support your meme? Or are you perhaps piqued because Joe won’t give you an interview too?? The story then bounced from the UK Mail to some Italian rag, who warps the UK Mail article into a message that the UK wants to but CAN’T use the SDB II. Some Indian defense news website in turn, now limps in with another perversion of the story. And I know a story has pretty much reached the sub-basement when this guy picks it up . But this story is a smashing success by Gawker Media standards: A low-brow Dis-Information Cascade. We are being memed to death on the F-35 these days as the mass media races to the bottom of the trough to make a headline. We’ll feel the interwebs hum for days about this crap, and then this 'non-factual factoid' will probably pop up for years--argued by the 90% who didn't read the article at the source but will remember Rogoway's lying headline. Update: If I'd realized a thread at F-16.net had already started washing Rogoway's spew overboard while I was at work I would have just pointed people there. I got this ready for publication last night, decided to check in and relax and found Rogoway's piece pretty much in tatters. So this ENTIRE exercise is over nit noi 'piece-part' changes? It will take longer to release the engineering drawings than it will to modify and install the new parts. Looks like the F-35 program is on to a highly effective technique for exposing Punk Journalists eh? : Just let them run with their ignorance and stupidity.